I am always drawn to Merlot which is not very surprising for a Merlot producer. 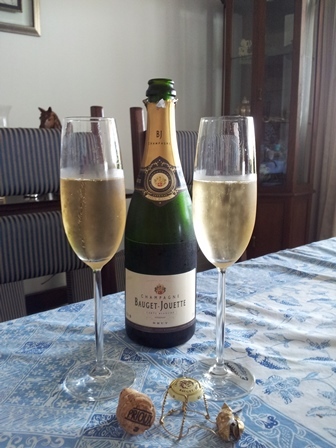 I try to extend my experience here in order to better appreciate my own wines. Our own Two Hills Merlot is often like biting into ripe cherries. Some of our vintages were “umpf” wines with lots of alcohol, tannins and bite, others were elegant and subtle. 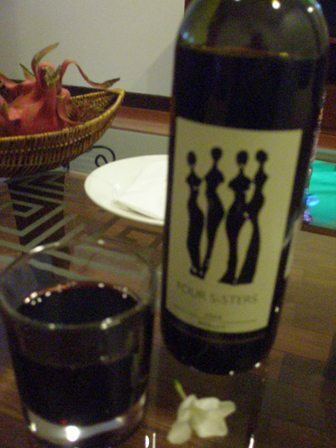 When I had the chance of buy a Merlot at Bacchus Corner in Saigon I could not say no. 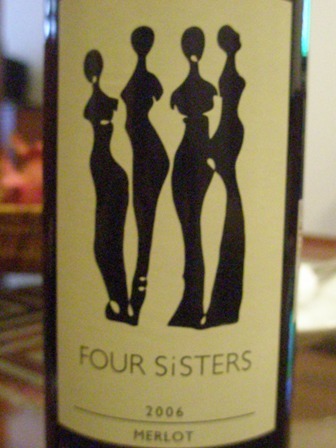 A ‘2006 Four Sisters Merlot’ seemed just the right stuff. 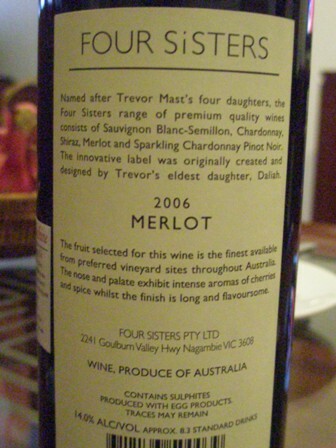 Four Sisters Winery is a joint venture between Trevor Mast of Mount Langi Ghiran, and Alistair Purbrick of Chateau Tahbilk. I selected the bottle mainly because of the label (and the price 380,000 Dong). In Australia the wine retails for about A$ 12 to 15. I found the silhouettes of the “Four Sisters” interesting. What I did not like from the outset was, that the back label told me that the grapes for this wine (of course only the best were selected) were sourced from all over Australia. What a blend, I thought and blended it is also with some other red varieties (which the label does not say). The wine is medium bodied. It’s colour is a ruby red and the alcohol content is big (with 14% vol.). Plum was the dominant fruit I tasted, and there was lots of it. I did not like the finish which was rough somehow. One should have the wine with food, I think, just straight is less desirable. Afterthought: try to drink it from a proper wine glass. The hotel did not leave me a choice, there was no wine glass in my room. 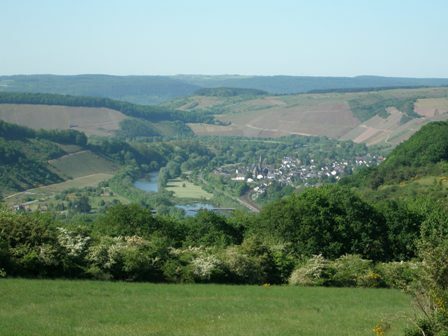 This entry was posted on Sunday, June 27th, 2010 at 8:16 am and is filed under wine, wine regions, wineries. You can follow any responses to this entry through the RSS 2.0 feed. You can leave a response, or trackback from your own site. topics as yours and I think we could greatly benmefit from each other. to hearing from you! Supoerb blog by the way!